The mystery song is Ammunition by All Good Children, a band from Hamilton, Ontario. Thanks to everyone who had fun helping us solve this mystery! Big thanks to Stephen Quinn and Lisa Christiansen from CBC Radio One’s On the Coast for understanding this nutty nostalgic quest and for putting it on the air in the first place. And brownie points to CBC for publishing this article. The mystery was solved simultaneously on Twitter and in the CBC website comments, including one tweet from band The Killjoys, who knew the song immediately, and by people who knew members in the band. Thanks to everyone who helped us complete our 22 year old quest. My sister said it best: It’s the end of an era! Can you help me identify this mystery song? It’s been stumping music geeks since March of 1993. Even the most renowned music gurus are stumped by this. It’s no longer about the song or the band, but the fact that nobody can identify this song is what has me so intrigued. Certainly there must be somebody out there who recognizes it. Are you that person? Note: The first few seconds of the recording sound static-y. Ignore this, it clears up. At first it almost sounds Roger Waters-ish, but then around the 35 second mark it transforms into an alternate universe early 90’s-era U2. It’s uncanny! 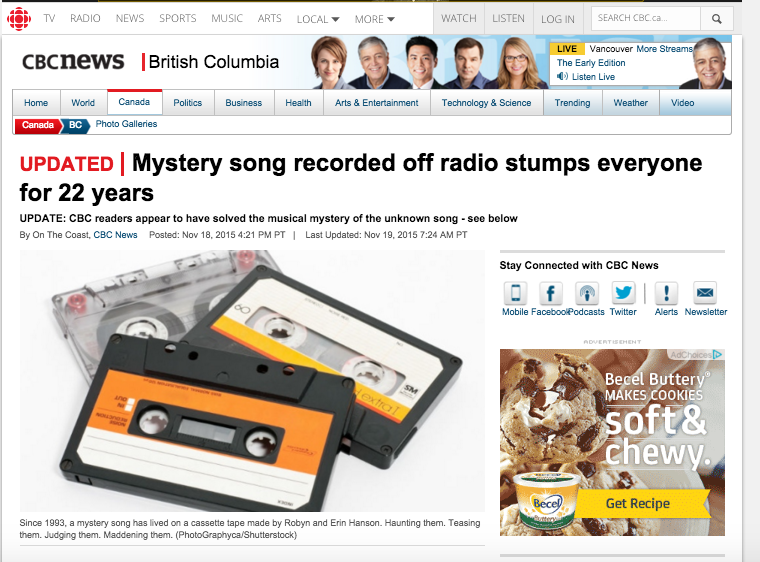 Stephen Quinn from CBC’s On The Coast heard about this story through Twitter and is going to air my musical mystery today at 3:35pm PST on CBC Radio One (88.1 FM in Vancouver – stream it online, here). You can follow along a few Reddit threads where people are trying to solve this mystery, here, here, and here. You can read my first failed attempt to solve this mystery back in 2002 on a U2 discussion forum. There are 11 amusing pages of discussion amongst U2 diehard fans to sift through, here. You can read another archived discussion circa 2002, here. I can only hope the original band members hear this song and come forward! The song sounds like it was produced in a studio. This is not recorded on a foreign language or college radio station. Shazam won’t bring it up. Nardwuar The Human Serviette doesn’t recognize it. Buzz Bishop (a DJ on Z95.3 at the time) doesn’t recognize it, but confirmed with me that the sound effect at the end was from Z95.3. George Strombolopoulos doesn’t recognize it. Grant Lawrence, Alan Cross, or Kim Clark Champniss don’t recognize it. All of my music guru friends don’t recognize it. Thanks for the support, Scott! Music nerds unite! Is there another link? I don’t hear any sound when I play it. Nevermind, got it to play on my phone. Should check with someone who was active in the Vancouver music biz at that time – like Paul Hyde and Bob Rock – maybe they would recognize it! Perhaps. I reached out to quite a few people who were active in Vancouver’s music scene at the time, but mostly DJs… and nobody knows! However, I haven’t even attempted to reach out to Paul Hyde or Bob Rock, or anything from the business side of things. Hmmmm. The musics a lot like “After All” / Early “Pure” … Todd Simko guitar sounds. Just can’t place the vocals though. This might just be the ultimate nostalgia search I have ever seen on the internet. Unfortunately, I’ve never heard this song in my life. Very sorry. Awww, haha, thanks. I never expected this to become my life’s quest, but there you go! I too don’t recognize it but several years ago there use to be a radio show on CBC radio called the Hum Line and they solved songs like this on the show. It is now gone which is to bad but I remember one of the guys on the show was Danny Marks if you can contact him he might be able to help (might live in Toronto) It is not a solve but a direction to look to. Thanks for the suggestion, Randy. I’ll see if I can reach Danny. I spoke with Stephen Quinn from CBC Radio’s On The Coast last Friday, and we recorded a little interview which, as far as I’m aware still hasn’t aired yet… but might in the near future, and that might open this story up to somebody who knows. Sounds like The Inside, a local band from San Francisco. Simple Minds were a big influence on them. Roger Martinez on vocals. Hmmm. Doesn’t sound like them, and if that album was released in 1998 as the Copyright suggests, then it was released 5 years after I recorded this song off the radio. So probably not the band. No, the lyrics don’t match. i’ve posted it to a couple subreddits, so maybe reddit can work some magic. a follow up to this from the reddit thread: some suggestions to look within the almost self-contained christian music scene. I agree with you about it being a Vancouver demo. Although the LG73 I recall from the 80’s was adverse to anything not already a hit, it may have changed things up with the advent of COAST 800/1040’s push for local and independent CanCon. CFOX and CFMI both ended up playing more local bands because of COAST and both quit playing local music pretty quickly after COAST died. It sounds familiar, I almost want to say Rhymes with Orange, but I don’t recall them being generically U2ish. Maybe ©, they were very commercial sounding. I’d ask anyone who worked at the old COAST if you can track them down. I just flipped through the first 2 Rhymes With Orange albums, and while this track isn’t on them – I can hear some similarities both in the music and the voice. RWO was my immediate thought too. But nope. Following up on Jeff_zpm’s thoughts, like him when this came up somewhere else a few months ago we had pegged it as Todd Simko / Pure demo material but after further discussion we think it may be Satsuma / Todd Simko collaboration demo before Pure. We do think it was Scott Acomba on vocals. The time frame fits. This does sound a little bit like Copyright, but I’ve only ever heard their second album. The style is somewhat similar, and the vocalist could be the same. I’d try to track down their first album – Wikipedia says it was released in 1991 by Geffen, so this could be a late single from it, maybe? Or maybe just a song the DJ liked? CFOX used to have their Demo Listen Derby nightly (weekly?) for submitted demo tapes. Maybe a one-off shot from an unknown, maybe one of the suggestions above. The DJ who played it probably didn’t even keep track! But then, some nights you hear a song or see a new band and it’s a top-ten music moment for ever after. Why live music is so great! I asked Terry David Mulligan and he thinks it’s called “Please Wait”. I searched but obviously Google is a dead end do to the age. Good luck. Chris beat me to it – I was going to suggest asking TDM. the band is All Good Children from Hamilton ON. Perhaps it’s a one-off song created as charity fundraiser for Live Aid or Band Aid or something similar. If so, it could still be Bono. I know Frank Koren of the band still tours & performs. He’d be the best to confirm & shed some more light on the song! CFNY 102.1 New Music Search Finalists circa 1993? I’m going to call it. 2:19 minutes of redundance. of all the weak acts to rip off? that hypemachine U2! I immediately thought “this has to be copyright” but some comments say it’s not. You got me! All Good Children. Song is called Ammunition.